Blue Moon Burgers is a local Seattle burger restaurant with two locations. They serve only all-natural beef and fresh-cut fries, so for a while now I’ve been trying to find the opportunity to give them a try. Last Sunday was finally the day. Like I always do when trying a new restaurant, I ordered a bacon cheeseburger. At Blue Moon that means hickory smoked bacon, your choice of cheese – I chose cheddar – tomato, red onion, pickles – hold the pickles, please! – and Blue Moon sauce. The patties are quarter-pound chuck, and I selected the potato bun. Rather than asking for medium-rare, I let them cook it to their default medium. When I unwrapped my burger, my first reaction was strongly positive. I was immediately struck by the fact that this burger looked and smelled great. Unfortunately my first bite greeted me with a big chunk of pickle, and I just can’t stand pickles. I took the bun off, and sure enough there were three pickles waiting for me. This always annoys me so I double-checked the receipt, and sure enough I’d ordered it without pickles. There was also an issue with how my burger was cooked. It definitely wasn’t done to medium – more medium-well. Patties being overcooked is a common problem, and it’s especially disappointing at a restaurant that’s going out of their way to serve quality beef that could really shine when treated well. On the other hand, one thing that Blue Moon definitely gets right is balance. The ratio of burger-to-toppings-to-bun was just about perfect. I often find that one ingredient overwhelms the others, but they nailed it. 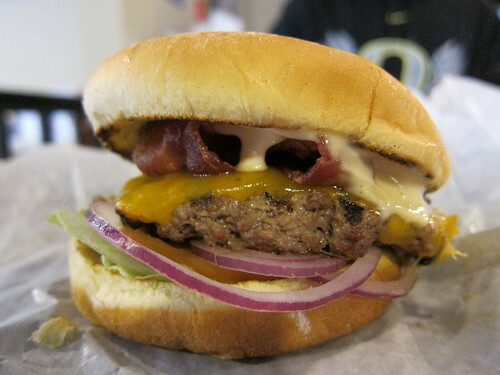 As for the rest of the burger – everything was very good. Nice bacon, quality veggies, the Blue Moon sauce was good, and the potato bun was just right. You can see in the photo that the bun was toasted and the cheese was perfectly melted. Had the cook been on his game when I’d been there this burger had the makings of greatness. Briefly, non-burger things – I ordered both the fresh-cut fries and the side of the month – deep-fried mac & cheese. The fries really benefited from being fresh-cut and were much better than average. Personally, I prefer thicker cut fries because they’re less hassle to eat, but I’d always take these over anything from a freezer. The mac & cheesewas a little dissapointing. For me the pleasure of deep-fried mac & cheese is the hot gooeyness of them but mine were only warm, not hot. I’m guessing that they were either too cold before going into the fryer or were cooked at a less than ideal temperature. The vanilla shake I ordered was excellent. Blue Moon is good but you missed the best part (of the Fremont location). Walking your burger down the block to the Fremont Brewery Tap Room and having it with a fresh pint.